Don’t judge Josh’s Cafe by the bright multi-coloured walls and noisy family cafe vibe – as I did. Josh is very serious about his food. Very serious. As an understudy of Serif Kaya’s at the Ottoman I suppose I shouldn’t have under-estimated how damn fine his persian-inspired menu would be. But this in Berrima? Who would have believed it. A food stop on the highway between Canberra and Sydney doesn’t do it justice. Make Josh’s Cafe your destination. Now. This entry was posted in Berrima, Cafes, Chefs on May 18, 2009 by dearindira2013. The high country of New South Wales must be one of the most spectacular parts of this wide brown land of ours – undulating grassy plains, magic light, moody skies, ghost gums and soaring mountains. At this time of year it attracts many tourists, mainly skiers and advernturers heading off to Jindabyne and Thredbo to test their skills on the new season’s snow fields. So how does an avowed foodie find herself in ‘Snowy’ country in the sleepy alpine town of Cooma? We’re actually on a pilgrimmage to visit my husband’s first childhood family home at 3 Nimby Place, Cooma. It’s a humble white weatherboard cottage still bordered by a low stone-brick wall my father-in-law built 50 years ago! 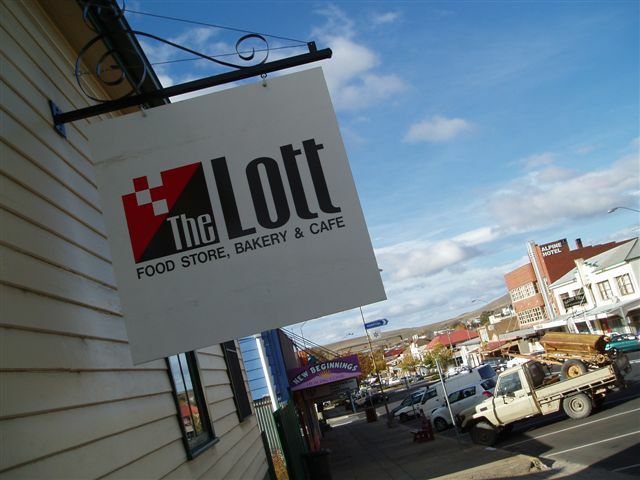 Our lunch stop is at the rustic ‘Lott Food Store, Bakery and Cafe’. This little gem of a find greets us with a roaring open fire and a blackboard menu of slow winter bakes, pies and warming pastas. The Lott gets my recommendation. This entry was posted in Cafes, Cooma on May 18, 2009 by dearindira2013.